Emirates, a global connector of people and places, has commenced its first scheduled Airbus A380 service to India with a daily flight between Dubai and Mumbai. To mark these first flights passengers on board EK500 and EK501 from Dubai and Mumbai were given a special commemorative certificate and gift. In addition, a specially commissioned piece of artwork, a traditional Indian “Rangoli” was created by local Mumbai artists. Emirates now has 50 A380s in its fleet of 224 wide-bodied aircraft and is the largest operator in the world of the double-decker with 90 more on order. Mumbai is the newest destination on its A380 network, and follows closely on the heels of Kuwait, which started on 16th July. The A380 offers passengers travelling to and from Mumbai a choice of 14 First Class Suites, 76 lie-flat Business Class seats on the upper deck and 399 comfortable Economy Class seats in four sections on the main deck. Every seat on board is connected to ice, which has just been voted the world’s best inflight entertainment system for the 10th year in a row by Skytrax, the world’s largest airline passenger satisfaction survey of over 18 million passengers worldwide. 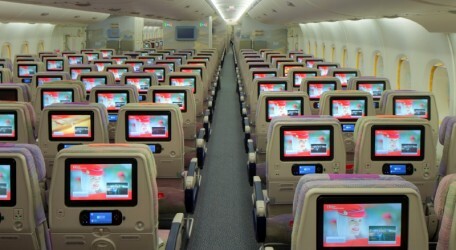 ice Digital widescreen offers passengers up to 1,800 channels of multi-lingual entertainment including the latest movies, television programmes and podcasts, international music collections including the ability for passengers to build their own playlists for the journey, and in seat wi-fi to allow for a connected as well as entertaining flight. Passengers in all cabins can enjoy Emirates’ recently launched Indian menu which features regionally themed dishes from across India, served by multilingual cabin crew.